BONN – Satirists, pianists, street artists – an unlikely melting pot for a media gathering? Not really … when the issue that binds them together with journalists and media is human rights, values and freedom. Professionals representing a wide range of minds and different fields – with the link being rights – met on June 13-15 at the 9th annual Global Media Forum organized by Deutsche Welle (DW) in the German city of Bonn, the country’s former administrative capital. 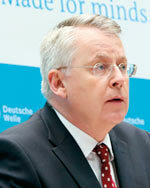 DW is Germany’s international broadcaster reaching an audience of 140 million. It has around 3,000 employees and freelancers from 60 countries. The theme of the meeting was “Media, Freedom, Values” with over 2000 participants from 110 countries taking part. The final day included a discussion between Ahmed al-Basheer, a satirist from Iraq; Aeham Ahmed, a Palestinian-Syrian pianist; Ammar Abo Bakr, an Egyptian street artist; as well as two German musicians Samy Deluxe and Fetsum on the power and effects of art and culture on politics. “Old issues should not be the issues of the future generation. This is what I try to convey with my music,” said Eqyptian-born Fetsum. “We need to pick up a dialogue instead of demonizing issues. Art and music offer a great platform to do this. Some participants from West Asia or Asia had haunting stories to share like the Afghan journalist who escaped hidden in a coffin fleeing from the Taliban or the real-life rich Prince from Nigeria who is leading a ‘beggar’s life” in Croatia after being persecuted simply because he was a Christian. One of the highlights of the 3-day meeting held in unusual summertime weather in Europe with intermittent showers which saw organisers dole out see-through, portable raincoats, was when Sedat Ergin, Editor-in-Chief of the Turkish daily newspaper “Hürriyet,” received the Deutsche Welle Freedom of Speech Award. In his laudation for Sedat Ergin, fellow journalist and publisher of the German newspaper “BILD,” Kai Diekmann said: “The freedom of the press is a valuable and noble good. We must not tire of addressing the terrible state of the freedom of the press and opinion in Turkey. The discussions over the three days ranged from the changing face of international broadcasting and public broadcasters to values and ethics among other subjects. While the plenaries dealt with cross-cutting themes like migration, new media including blogging, values and ethics and an interesting insight into drone journalism, the breakout sessions were even more interesting because it was held in smaller rooms with greater interaction between panellists and the audience.